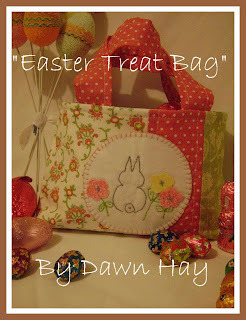 As sweet as cinnamon: Easter Treat Bags! making Easter Treat Bags for my girls. the garden to find their Easter Eggs. cute little bag to carry around. It was so simple to make and stitch, only took one night. Do you have a little person to make one for? or wherever you search for them. Thanks Dawn! this is adorable, and I'll be making two for young lady Easter guests! This is so sweet, its a lovely bag and they will love using it. Dawnie the little bag is adorable, makes me wish I had someone tiny to make one for ;o)!!! thank you, dawn, for sharing your sweet little treat bag. It is just too dawgone cute! Love the wee easter bags Dawn. Will make a couple for the grandies. 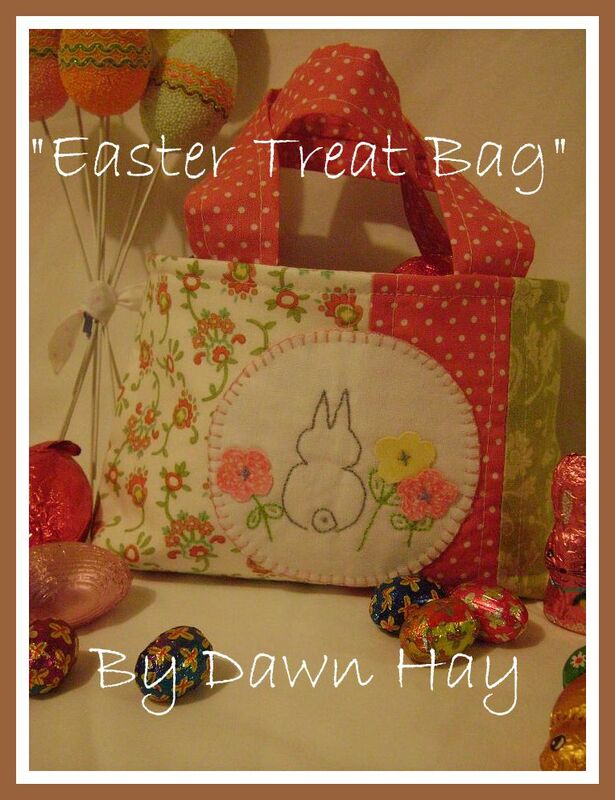 Oh Dawn that is THE cutest little bag and bunny - thank you so much for sharing!!!!! Too cute Dawn!!! I shall be making one for Rosie - thank you so much for the pattern - you Easter Angel!!! See, told you I would catch you at Cinnamon. Love the little bag. I think one for my Granddaughter is a necessity. Now need a boys one for all my little grandsons. Dawn, Thank you so much for the Easter basket pattern. I have a grandson and new granddaughter who I know will enjoy them. Hiya Dawn! Have just completed the printing of your Easter Treat Bag to play with this afternoon :) Of course I am making it times 4 -- one each for the grand babies LOL Can't do one unless you for all! Thanks for the little baggie pattern--just in time! Thanks Dawn for this sweet pattern. It will make a nice little gift bag. I'm from CHile (does it ring a bell to you?...hope so). I got here somehow and I love your works...I'm not good at sewing or quilting, so I admire what you do...I liked your quilt a lot! I'd love to see you on my blog (it's quite new. Dawn, that is adorable. Such a cute idea. Been catching up on your blog. I know about being busy. You have do what you can and let other things go. Your girls are so cute with their quilts.